Sixteen activists and best-selling authors offer a lively, informal introduction to values we can live by. Global Values 101 grew out of one of the most popular courses ever offered at Harvard University, in which some of the most original thinkers of our day sat down with students and explored how ideas have made them-and can make us-more engaged, involved, and compassionate citizens. 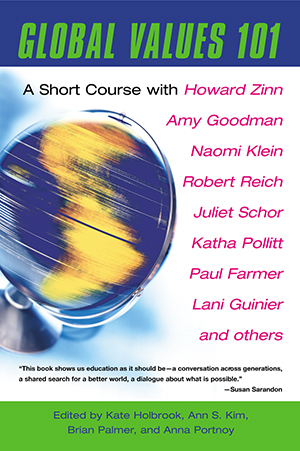 In these engrossing, essay-length interviews, which address the topics of war, religion, the global economy, and social change, Amy Goodman, host of the popular radio program Democracy Now, speaks about the role of the independent media as gatekeeper and witness; Lani Guinier, author of Tyranny of the Majority, reveals that students’ SAT scores more accurately describe the kind of car their parents drive than the grades they will earn in college and shows the way to a more equitable college admissions system; Howard Zinn, author of A People’s History of the United States, explores the American Dream and exposes the myth of the “good war“; economist Juliet Schor, author of Born to Buy and The Overspent American, explains why Americans are willing to sacrifice quality of life to attain financial success; former “mall rat” Naomi Klein, author of No Logo: Taking Aim at the Brand Bullies, urges readers to go global while fighting global conglomerates; and Katha Pollitt, author of Reasonable Creatures: Essays on Women and Feminism, employs her incisive wit to explore what it really means to be a feminist in the Twenty First century. For anyone who has been moved by idealism and longed to become a more proactive citizen, this collection offers a range of stories on how progressive ethics can inform, inspire, and ultimately transform lives. "The interviews with Lani Guinier, Noam Chomsky, Naomi Klein, Katha Pollitt, Robert Reich, and others elicit articulate and earnest responses about living "deliberately" in the world and seeking to make a difference. The results make this book well worth reading." "Equal parts social movement overview and undergraduate course reader, Global Values 101 is an introduction to some of the central issues of contemporary progressive politics…Global Values 101 is a valuable primer for young activists." "In its totality, Global Values 101 promotes citizenship, a concept often considered trite in modern American culture. A smart book." "The 16 interviews gathered here form a cohesive, essential primer on what it means, and what it takes, to be a responsive and responsible world citizen in today's turbulent times." "This book shows us education as it should be-a conversation across generations, a shared search for a better world, a dialogue about what is possible."